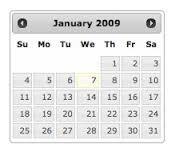 In this article we will see how to display button display bar in jQuery DatePicker. We need to set one boolean property showButtonPanel to true. The button panel has two buttons by default. One is Today button to select today's date in the calendar and other is Done button to close the DatePicker. Button are enabled by default when the bar is displayed, but can be turned off with additional options. We will create our ViewModel first. We need to include reference of above script files to make DatePicker work. Click inside textbox to display DatePicker. Thus setting the boolean property to true i.e. showButtonPanel displays the button panel bar. The buttons are enable by default. We can customize the button text and can include more buttons.